Another must-see as the Roadchix take on a new state is the capital building. 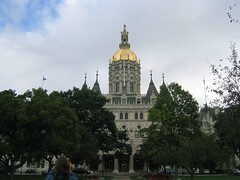 Connecticut's (in Hartford) is a typical gold-domed specimen. The 'chix were lucky enough to get a private tour (FREE and very extensive). We were treated to statues of the 'State Hero and Heroine'-Nathan Hale and Prudence Crandall. We thought that was pretty bizarre. . . I hereby appoint Kristy and I as our "Official State Roadtrippers." The building is so large that many of the offices are housed in an annex building with a tunnel system (good for those cold New England winters). Luckily, we managed to find our way back to the car to continue the journey.